Alan Stubbs admits Hibs have watched goalkeeper David Mitchell and left-back Jackson Longridge, although the head coach insists the Stranraer pair are just two of several names the club have been monitoring ahead of their venture into the transfer market next month. 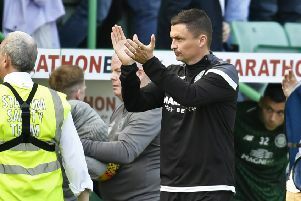 Stair Park boss Stephen Aitken claimed yesterday that “we are aware that Hibs have been tracking us across Scotland”, while it was also suggested that the Easter Road club had watched the League One club’s past ten games. Stubbs confirmed that Mitchell, 24, and Longridge, 19, were two players on his list of possible targets although he dismissed the claim that he has had representatives at all of Stranraer’s games since October. The Hibs head coach was keen to stress that his staff have been casting their net far and wide and that just because they have been running the rule over certain players, it does not necessarily mean they will be joining the club in January. “Supposedly we’ve had them watched ten times, but I can categorically say that is not the case,” he told the Evening News. “We’ve watched them a couple of times. It doesn’t mean we’re interested or not interested. We’re just actively looking everywhere at this moment in time at players who have been flagged up. That’s literally where we are. “We’ve got quite a few names and we’re just doing our due diligence in terms of going through them all. Stubbs is hopeful that captain Liam Craig will be fit enough to return for this weekend’s Championship match at home to Alloa this weekend after missing last Saturday’s defeat at Falkirk with a hamstring strain.